Every weekday morning in San Francisco’s SoMa district, a stream of workers disembark from the city’s commuter rail station carrying an assortment of small, wheeled devices—kick scooters, electric skateboards, hoverboards, and more—which they then use to roll on to their offices. These “personal transportation devices” (PTDs)—also called micromobility or microtransit—encompass a growing set of devices that provide low-speed, flexible mobility for individual travelers. In recent years, the number of PTD types and their use has exploded with the introduction of new devices. 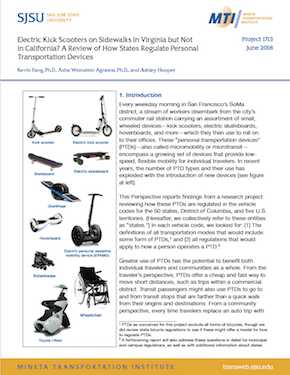 This Perspective reports findings from a research project reviewing how these PTDs are regulated in the vehicle codes for the 50 states, District of Columbia, and five U.S. territories. Kevin Fang is an Assistant Professor at Sonoma State University, Asha Weinstein Agrawal is a Professor at San José State University, and Ashley Hooper is a doctoral candidate at theUniversity of California, Irvine.